Sugar Metropolis might be the sweetest design project that you've ever laid your eyes on. A couple of sculptors from Ireland and England, Brendan Jamison and Mark Revels, respectively, are collaborating on the community-based project. Jamison has become known for creating art with sugar cubes. Some of his work is even displayed in the British prime minister's house. But his latest piece may be his largest undertaking yet. It started for the Royal Ulster Academy of Arts in Belfast. 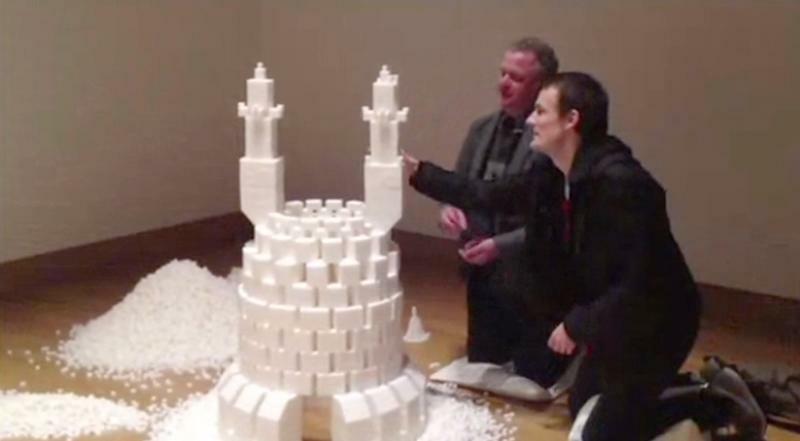 Every visitor to the Ulster Museum was invited to contribute to the sculpture made out of sugar cubes. About 5,000 people and 500,000 pieces later, the Sugar Metropolis rose. "It offers a multisensory experience, so the viewer doesn't just actually see the sculpture," he said. "They can imagine the taste of the sugar dissolving on their tongues." Jamison and his chief collaborator, Revels, have now started a campaign to bring the project to the U.S. Their "New York Sugar Metropolis" would land in the Sugar Hill district of Harlem this summer. On the project’s Kickstarter page, Jamison makes a case for why the sugar cube sculpture would benefit the area. "It reflects the true sense of the word 'community', with local residents of Harlem (spanning the entire spectrum from young children to pensioners) united in a shared purpose, dreaming of a positive future which everyone can help create," they write. "Sugar Metropolis can act as a catalyst to ignite the imagination of everyone in the local neighbourhood."